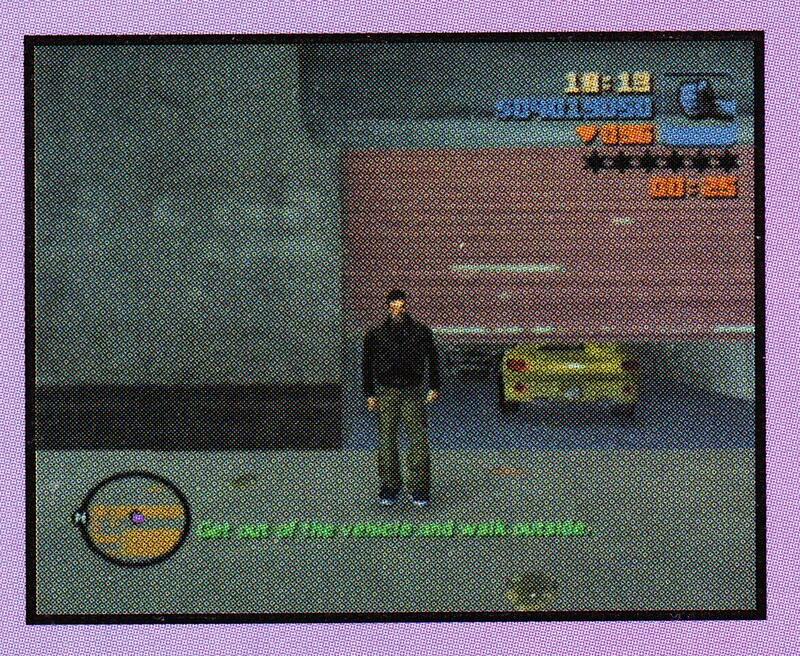 My GTA III Bradygames has arrived, but sadly, I can't make pictures at all. 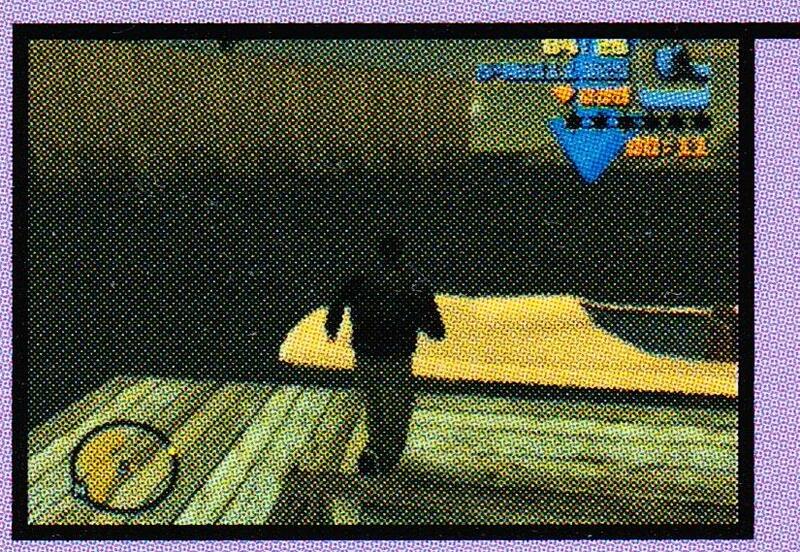 On the other hand, thehambon soon enough will finish scanning the same guide and the text below will make a sense for you. The biggest flaw, all these screens are too freaking small, thanks to the editor of this book, who decided to make them as small as possible. 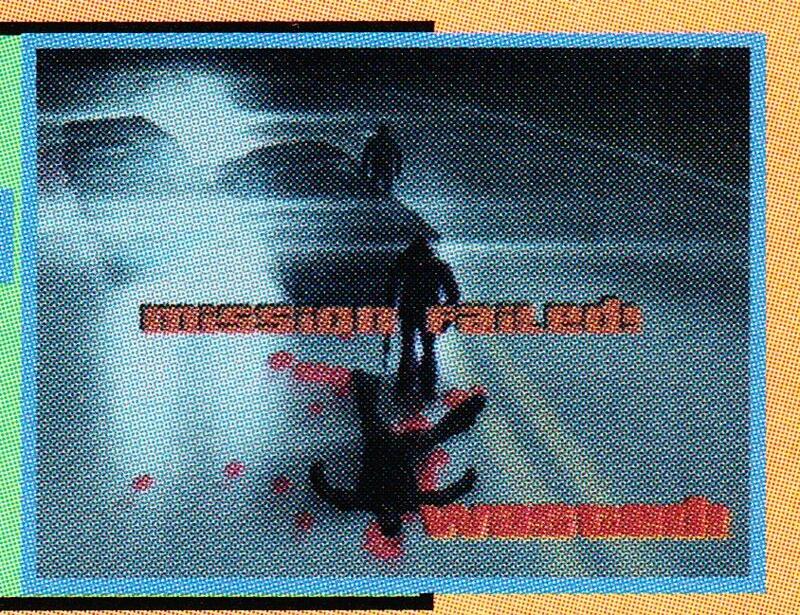 As a result, they won't look so clean on the scans, unfortunately. UPDATE. 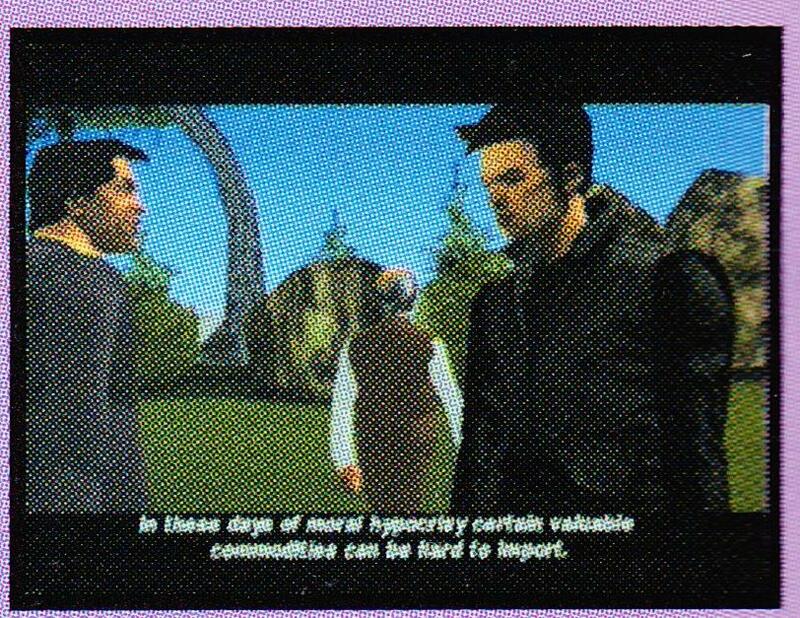 Found new stuff, it would be cool if someone in the future would quote these finds and add the screens from the scanned book. According to the amazon reviews, some packages are shown on incorrect places, bonuses from collecting these packages are also mixed. Might be beta stuff or typical mistake from Bradygames team. 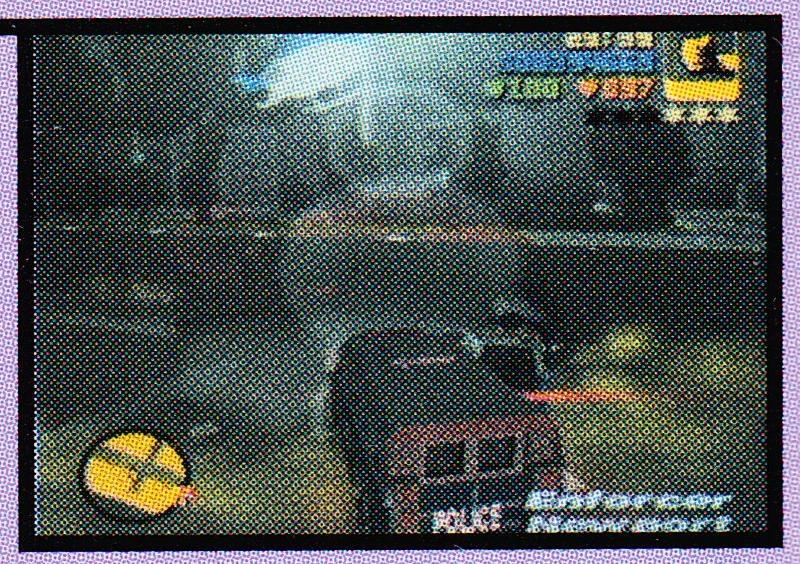 Sadly, my guide didn't feature additional Liberty City map, so I don't have a clue what's there. 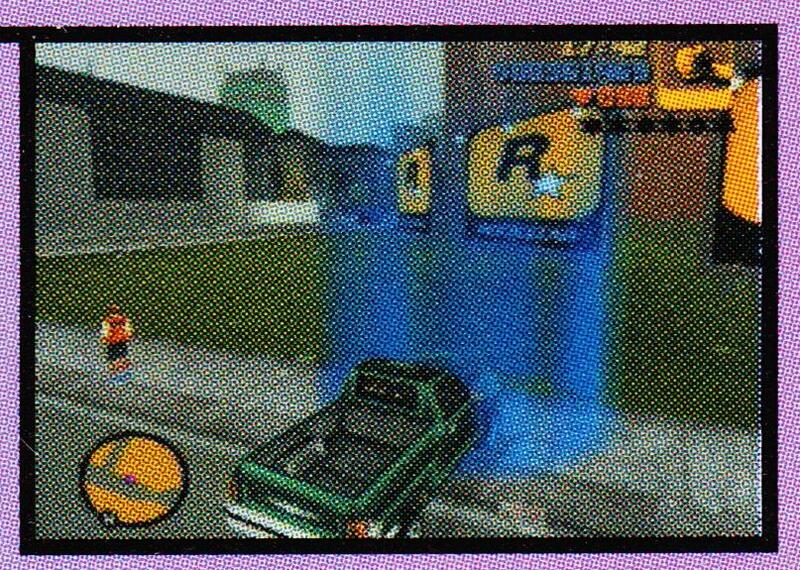 According to the writers, they sat around three weeks in the R* offices while making this guide. That's why all of these Bradygame guides have a mix of beta screens. 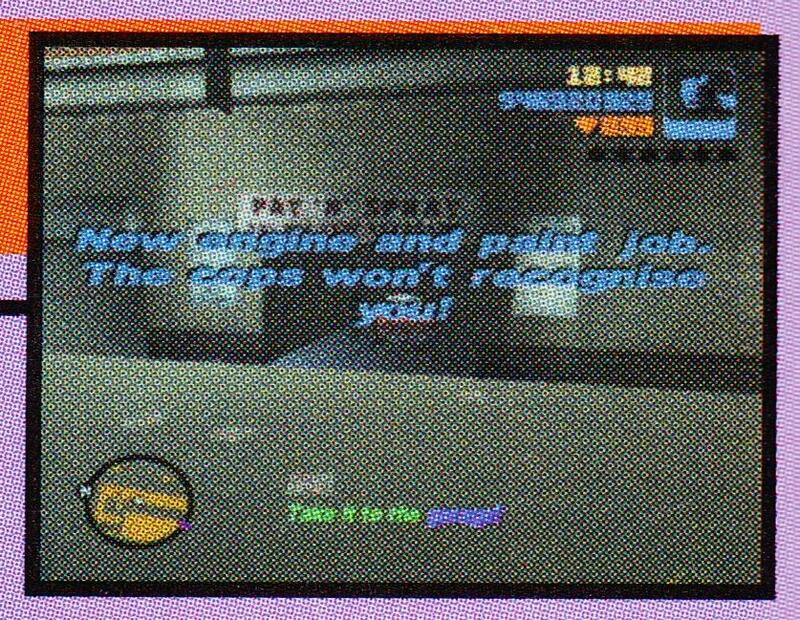 There is also GTA 3 Bradygames, which covers PC version, but dang, it is black and white, so it is just useless, unless you don't have an Internet and you want to beat the game by 100%. 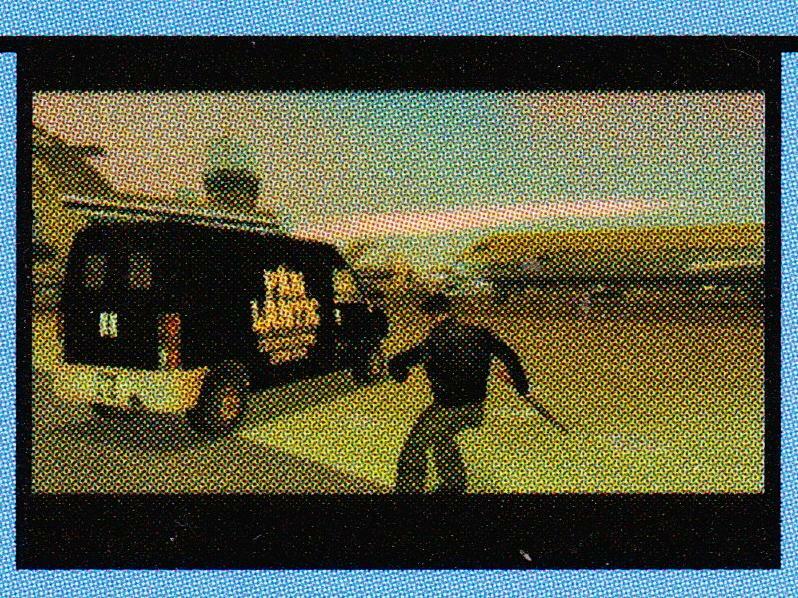 Edited July 19, 2015 by Vadim M.
Feels like R* knew that we would be interested in finding beta informations of the game 14 years later. Interestingly, if you switch the language to German, you will see exactly the same logo as on this promo. 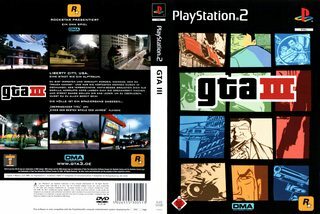 Even the PS2 version in Germany have this logo. I don't have a clue if it is a part of the censorship in Germany, but dang, why they have different logo. Off-topic. Can someone confirm if you change the language to German, the game will be cut (no blood). It doesn't work for me. Drop me a note in PM. ^I think it's all about the .exe, about blood. Yeah, That logo appears for me because of my region (Not only on german but also french) and removes blood and violent stuff. Changing the .exe with the bloodpatched one will also change the logo. Apparently at 0:39 you can hear him say 'get out of the car'. 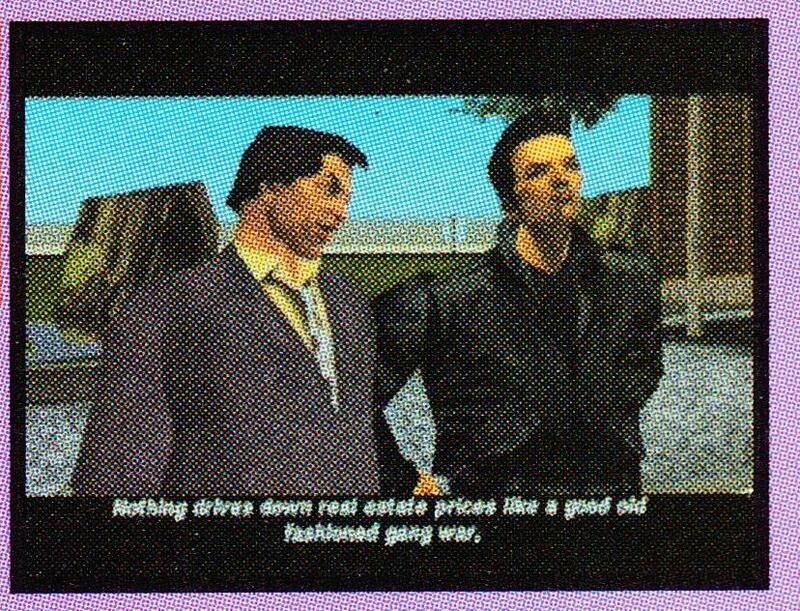 It was proved many times that it was voice from GTA 2 that was just used in the GTA 3 trailer to make it sounds more cool. Claude was not suppose to talk in the game. This is the Alpha and nothing is planned, it means perhaps that Salvatore's voice was actually Claude's voice. Hey guys, sorry for the long wait. I've had to deal with some real life stuff and its kept me away from the Forums for a few days. Anyway, the guide is nearly done with being scanned. After it's been scanned, I need to find away to compile all of the JPEGs into a single PDF, then I can start sending it out! Thanks to Vadim M. for finiding more beta content in the guide! Here some of the screenshots from the guide that he is referring to in his post above. Also note the blue Trenton text. Again, slightly blurry because of the curvature of the page. Interestingly, there's a shot of a black police cruiser directly above the blue one. The text is blue instead of yellow. Also note the blips on the radar. I don't recall seeing a blip that red (or that BIG) anywhere in the game. 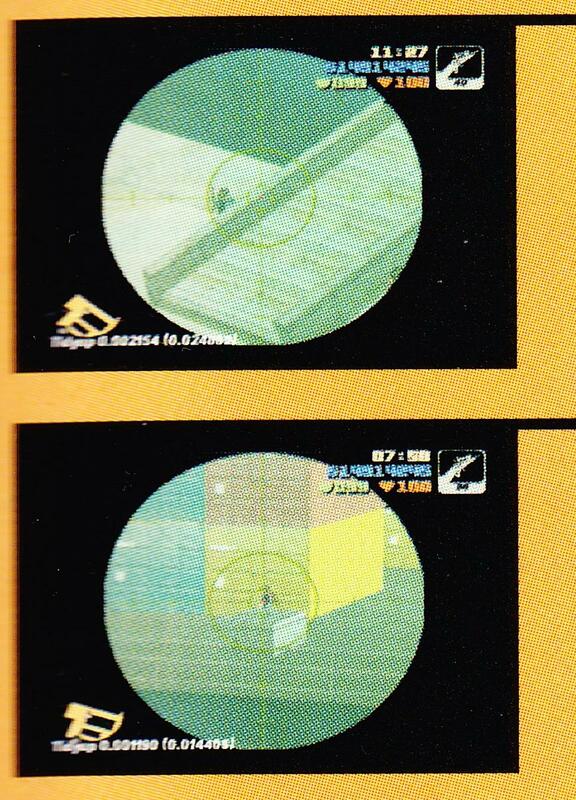 The minimap also lacks the detail for the buildings at Phil's armory. It looks much darker to me. The bumpers definitely look darker than they do in the final game. 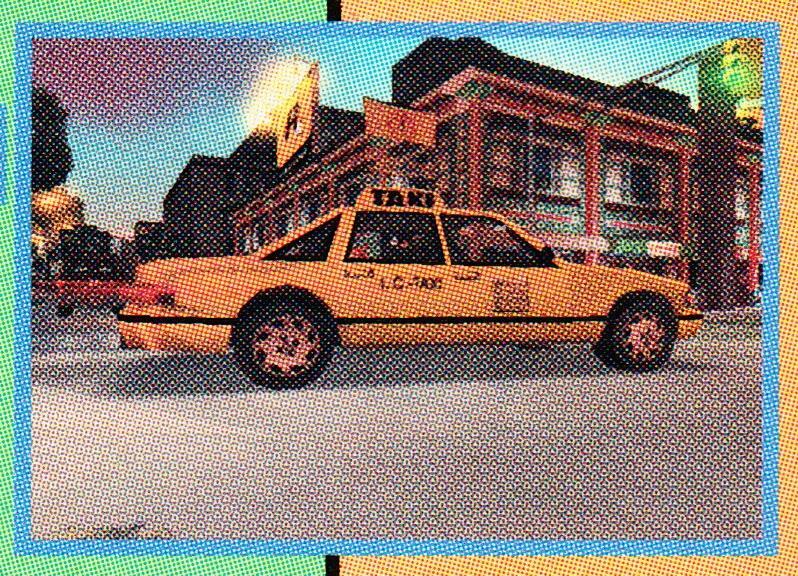 I wonder why different colored bumpers for the Taxis was cut. 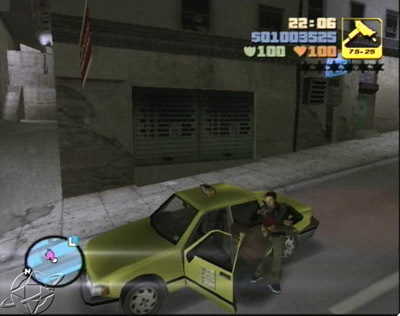 In LCS, Taxis spawn with yellow, gray, or black bumpers. In III, it's always gray. It could have possibly been different colors in the beta. 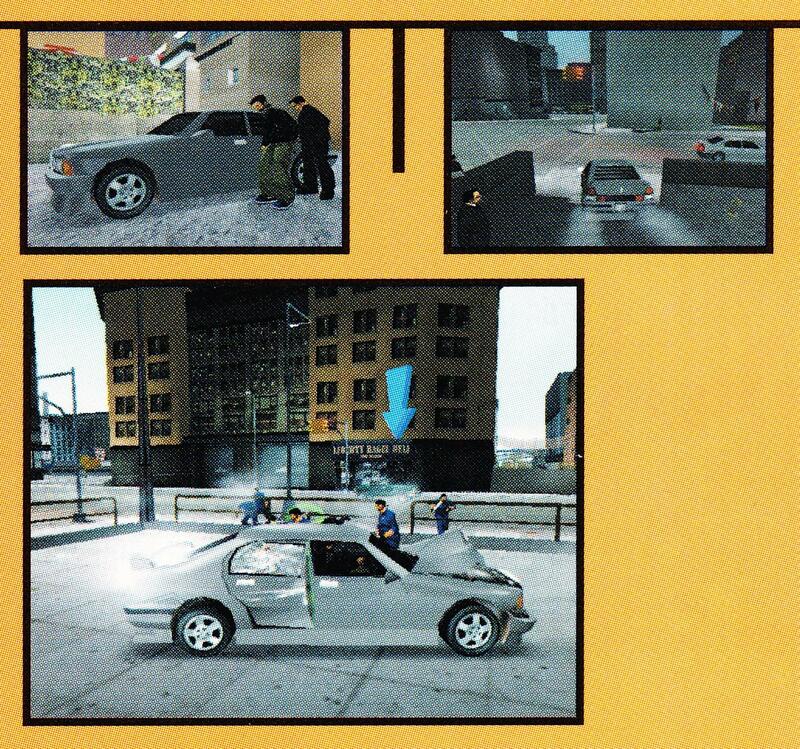 That bumper is very bright, similar to other beta vehicles. 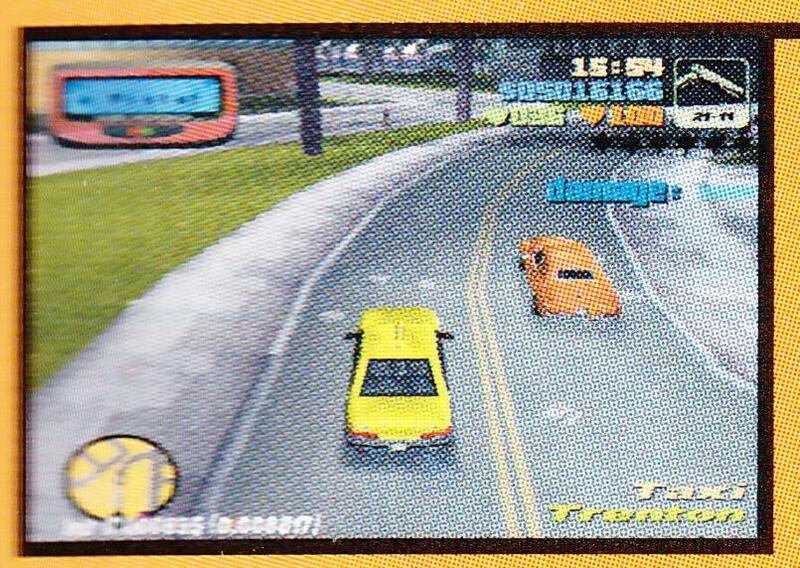 In the final game, it's the same color as the rest of the vehicle. I personally can't say that I've seen that color on the Banshee. Great finds, though. 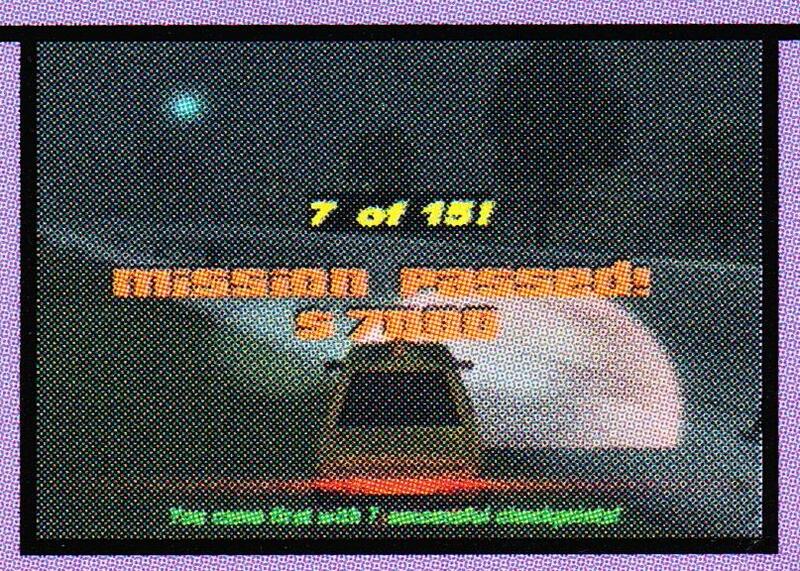 thehambone: Amazing screens and stuff. 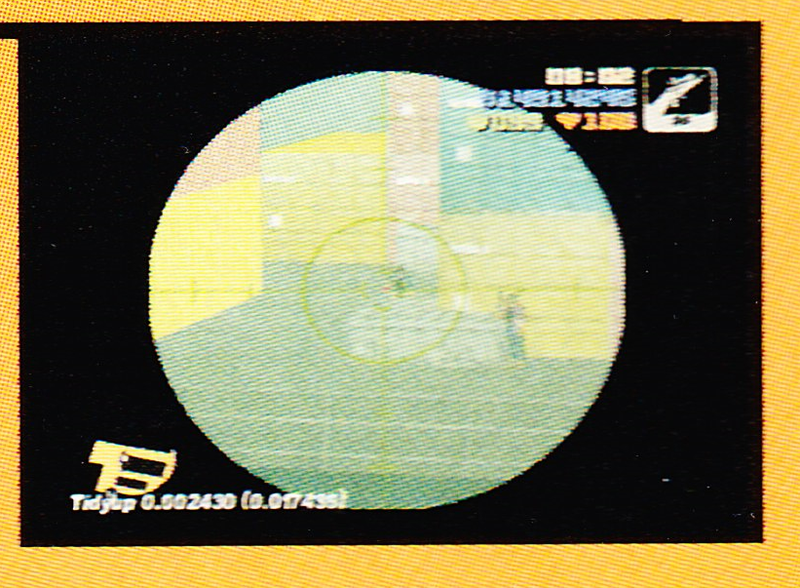 On many of thehambone's screenshots, the weapon icons look bright yellow just like on the PC. Were the screenshots done on a PC? Probably a PS2 development kit. 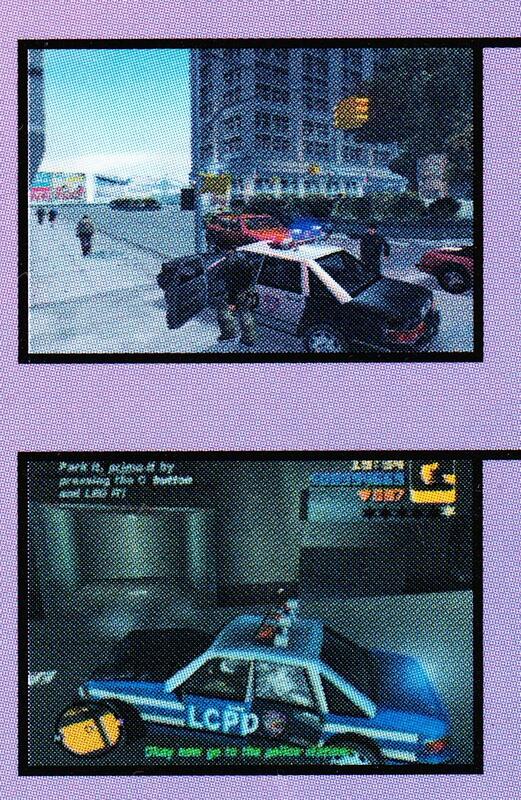 And those police cars pic. 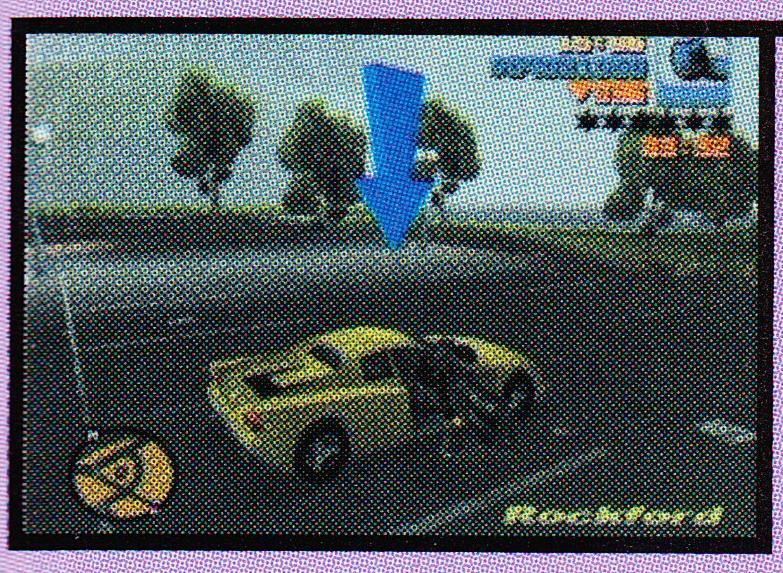 Nope, that yellow bright weapon icons is was supposed to appear on the PS2 version too. Interesting. The save icon is pink there too (not to mention the blue radar). 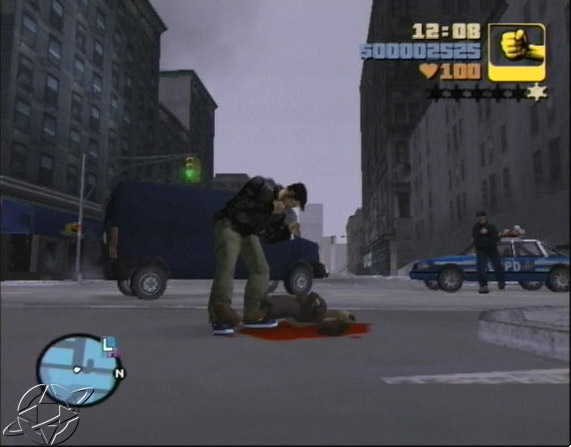 I suppose they changed it for the final PS2 version but the PC version is based on an earlier PS2 version. This seems to be the case in VC and SA as well. I never thought about this before. 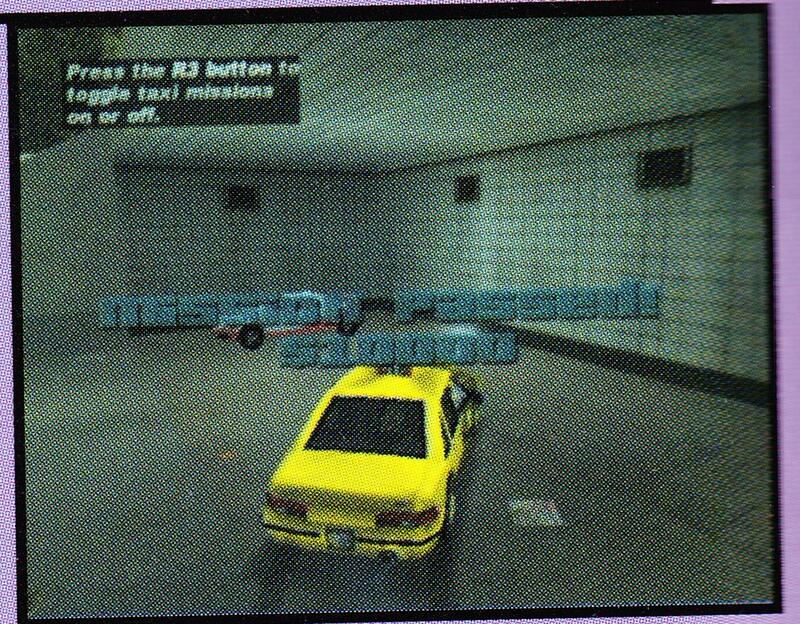 But I think you are right, maybe III and probably VC and SA is based on some earlier build from the PS2 version. 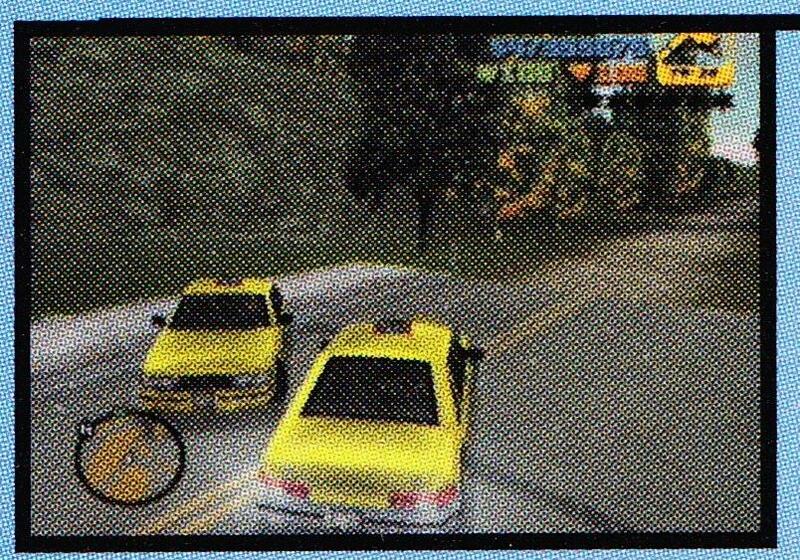 I always thought that the PC version of III, VC and SA were ports of the Xbox version of the game because the Xbox uses almost identical code to what a PC would use. Considering that the Xbox was basically a PC with a heavily modified version of Windows 2000. 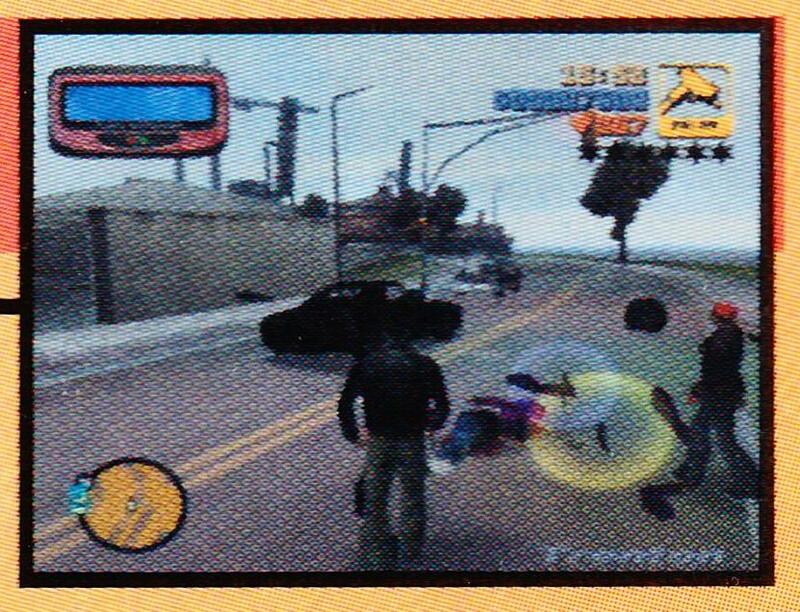 For SA this is very probable (they were at least developed in parallel), but the Xbox version of III and VC came after the PC version. Alright guys, I've finished scanning the guide and I'm currently uploading hosting low-, medium-, and high-quality PDF versions. Send me a PM if you would like the link and haven't PM'd me already. Edited previous post. All of the beta content that Vadim M. found now has a supplementing screenshot. I suggest you read through it again as I've added some notes within the spoiler tags on some of the images. 71 - Yakuza Stinger looks lighter-colored. 74 - Beta Speeder? Looks brighter like its missing some detail. 101, 102 - D-Ice's Infernus has a brighter color. I noticed car colors looking a bit lighter in other places too. 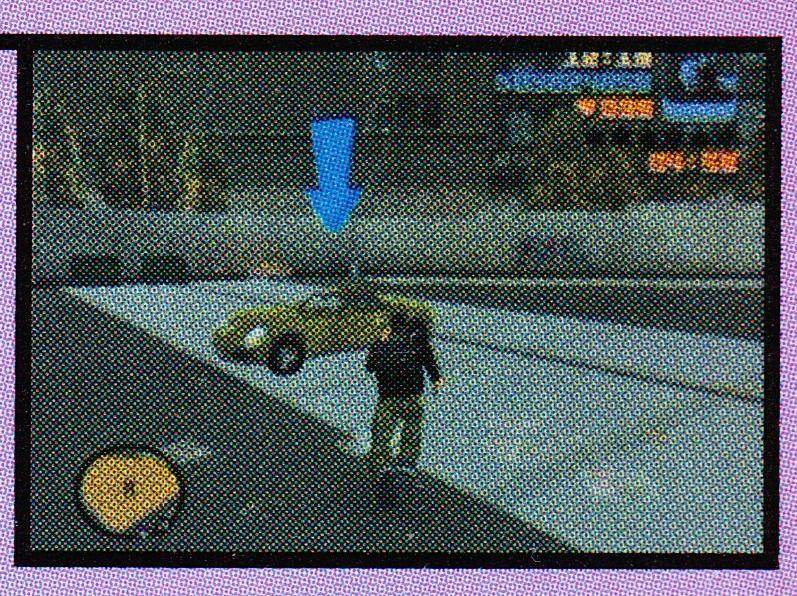 Also, more blue HUD! 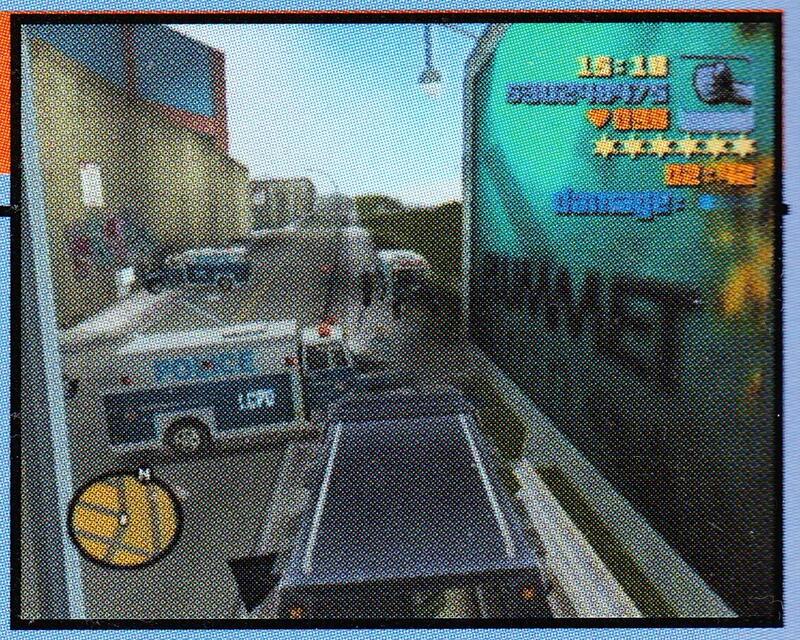 104 - "Rumpo Rumpage". Typo or beta name? Seems like a typo to me. 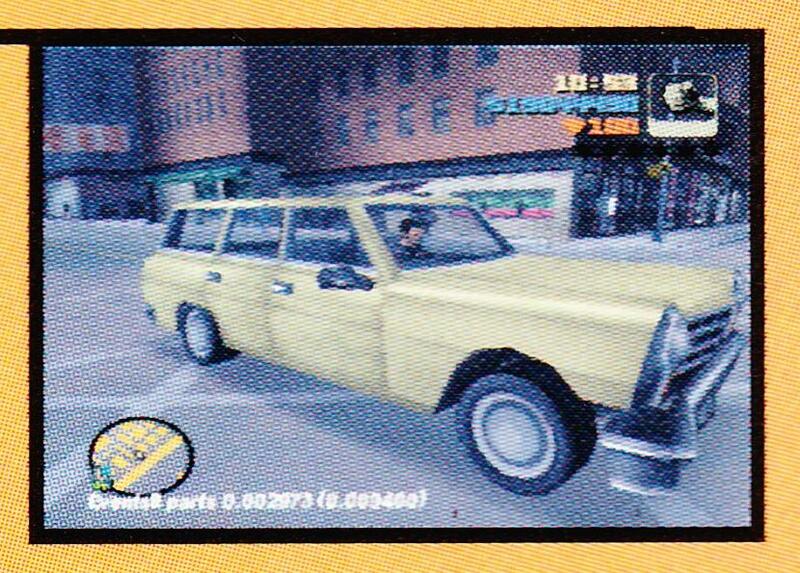 For some reason in one of the last close-to release builds none of the vehicles had body64/bodyb64 textures. Maybe R* thought they looked better that way for a while. 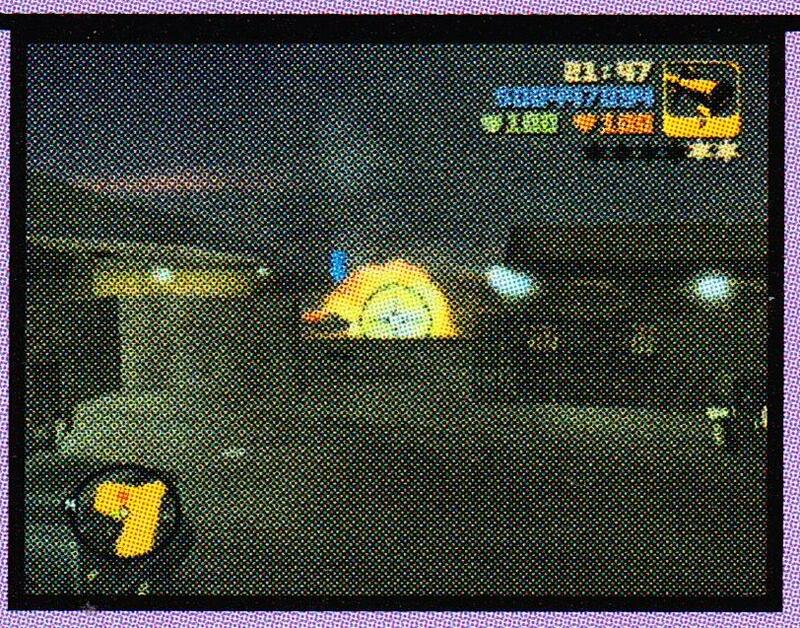 Hell, the Sentinel in the final PC release is bugged and has no body64 and bodyb64 textures. 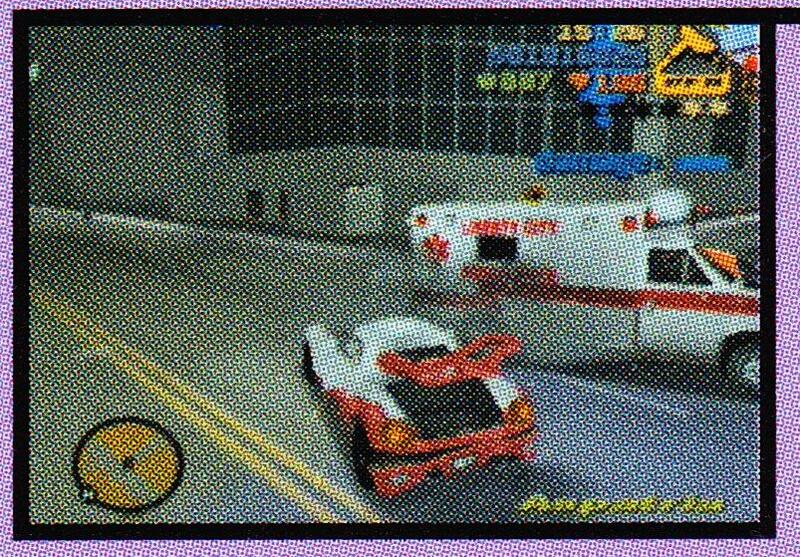 A friend of mine eons ago had ITBTD convert the PS2 GTA3 Sentinel to PC. 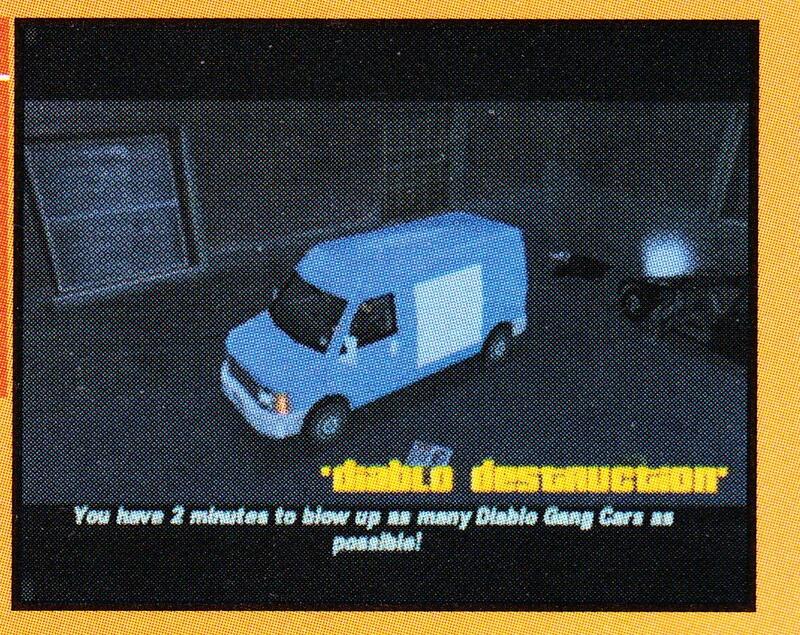 I doubt the vehicles were ever intended to look as light as they did in the beta. It's likely that the textures were simply unfinished. 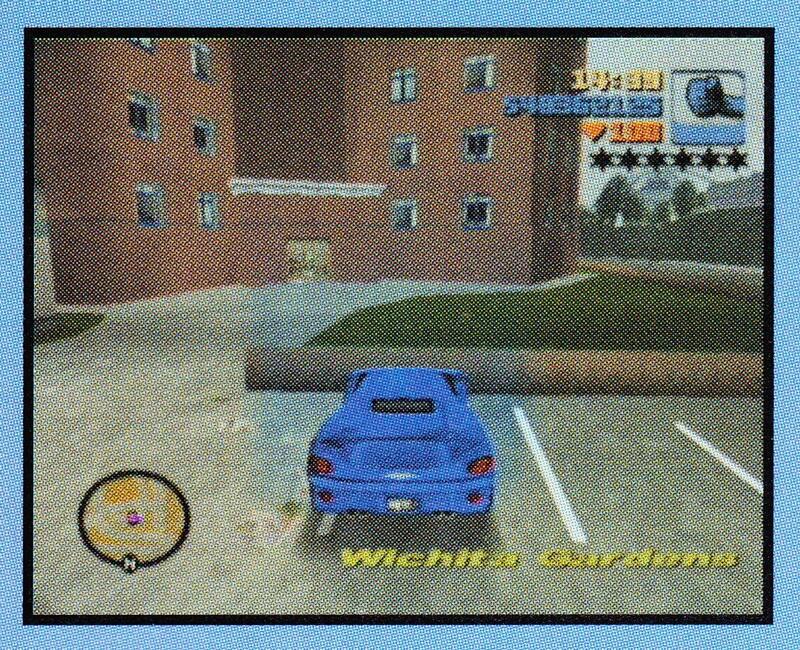 To add to that, there's no real reflections on the vehicles at all, which gives them the more flat and minimal appearance you see in the screenshots. 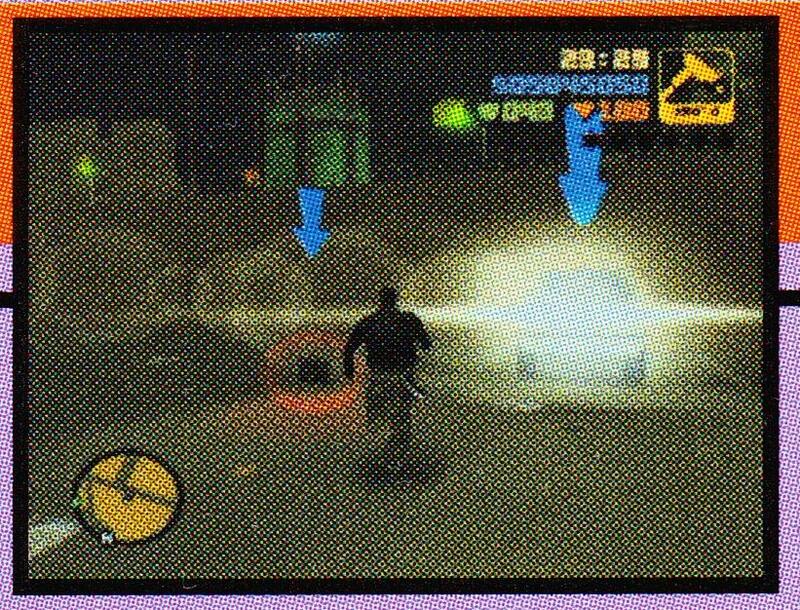 Well, if you look to all screenshots with the blue hud, the only icon in blue color is the fist in all screens and the other icons are yellow, something strange or in development in that time. 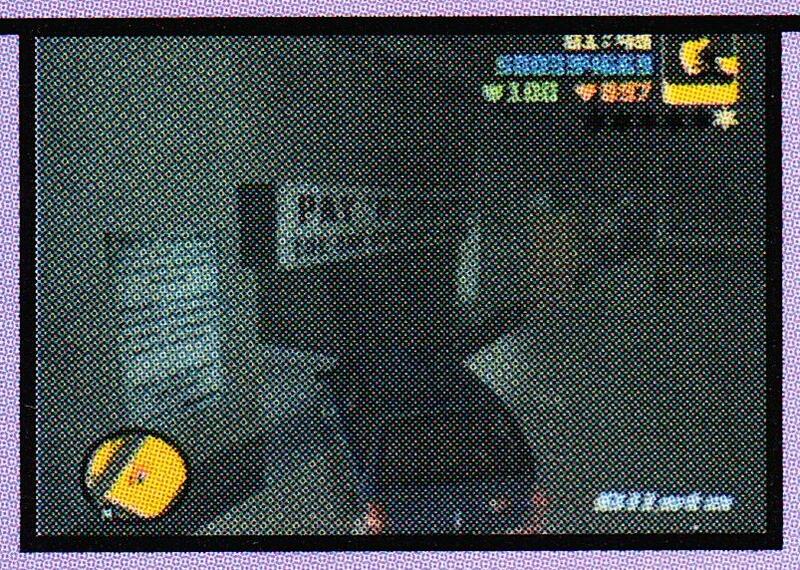 Yeah the Infernus (& many other vehicles) has the same type of color in LCS, the final version of GTA III has that dark tone as a primary color, I guess it was an intentional change as the game is supposed to have that dark feeling everywhere. That's what I was thinking too; they look like LCS colors. It's almost like these colors lack a sheen or something.